Thinkers Lodge - Thinkers Lodge - Beautiful, historic venue for weddings, conferences, and retreats in Nova Scotia, Canada. Welcome to Thinkers’ Lodge! Located on the Northumberland Strait at the mouth of the Pugwash River Estuary, Thinkers Lodge was declared a National Historic Site in 2008. The Pugwash Conferences of Science and World Affairs got their start here in 1957 when Cyrus Eaton hosted 22 scientists from both sides of the Iron Curtain to discuss the threat of Nuclear Weapons. Cyrus Eaton, a native of Pugwash, bought the “Pineo Lodge” in 1929 together with some adjoining buildings and land along the river after two successive fires had destroyed the river front. He then donated the property to a Nova Scotia non profit incorporated by an act of the Legislature. In 1955, Mr. Eaton decided to change the mission to focus on educational programs. Conferences, workshops, and educational events have been held here continuously since 1955. The most famous conference was the first Pugwash Conference on Science and World Affairs in 1957 that led to a Nobel Peace Prize in 1995 shared by the Conferences and Joseph Rotblat, its spiritual leader. Rotblat’s Nobel is on display at the Lodge. 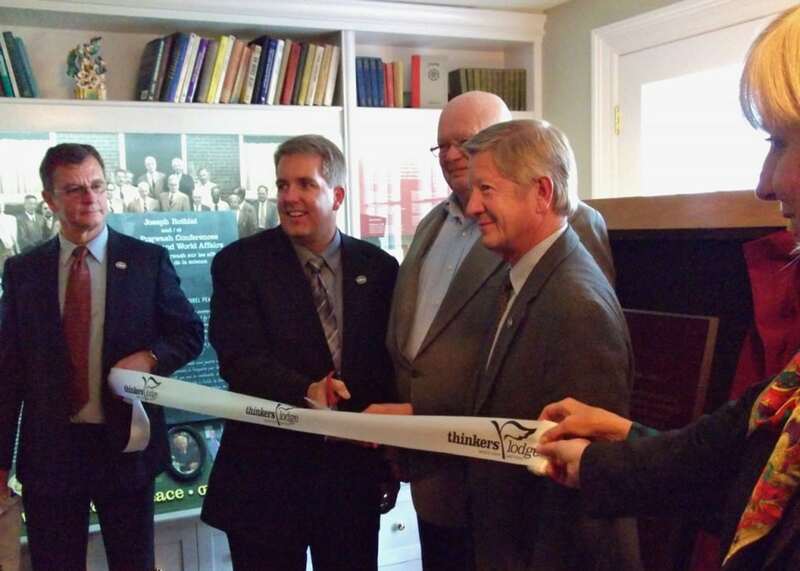 Thinkers Lodge has been completely restored over the last three years and enhanced with interpretive displays that help tell the story of how history was made here.